Israel shelled a Gaza Strip hospital and killed at least four people on the same day that seven Israeli soldiers died in a firefight in Gaza. The Israeli military confirmed the deaths on Monday, but did not give any further information on the circumstances on Monday. 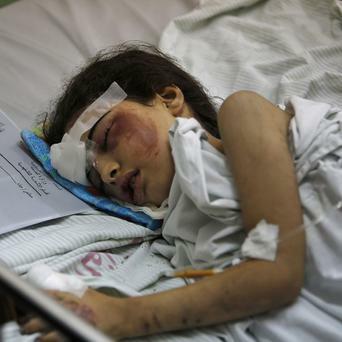 The incident raises the Israeli death toll to 27, including two civilians. Earlier in the day, Israeli tanks reportedly shelled a hospital in Gaza, killing at least four people and wounding 60, half of whom were medical staff. 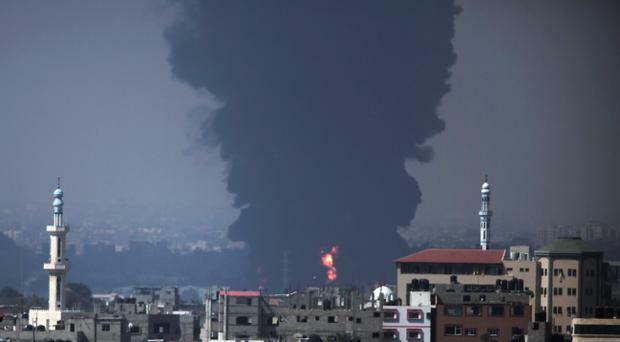 The reported strikes on its hospital came as the Palestinian death toll across Gaza rose to at least 550, with more than 3,100 wounded, since 8 July, officials said. A Palestinian health official said that 12 shells had been fired at the Al Aqsa hospital in the town of Deir el-Balah, striking parts of the building that included the intensive care unit and the surgery department. The wounded were shown in live footage from Hamas's local TV station in Al Aqsa being moved on gurneys to the emergency department. The health official, Ashraf al-Kidra, told the Associated Press that 30 of those hurt were working as medical staff at the hospital. The Israeli military said it was looking into the report, which came from a different part of Gaza to the Al Wafa hospital that was damaged by missile fire last week. A doctor at the hospital, Fayez Zidane, told the Al Aqsa station that shells hit the third and fourth floor as well as the reception area. "There is still shelling against the hospital," he said. He said he found bits of a rocket, presumably from one of the projectiles. The Al Aqsa district was one of those visited by Pope Francis when he toured Gaza and Israel towards the end of May - a foray for peace that is far removed from today's rapidly escalating Middle East crisis. On the Israeli side, 18 soldiers and two civilians have been killed, including two American citizens fighting for the Israeli Defence Forces (IDF). Yesterday saw more than 100 deaths in a single offensive on the district of Shijaiyah, described as a "terror stronghold" by the IDF but home to around 100,000 people. The US Secretary of State, John Kerry, has flown to Cairo today join diplomatic efforts to secure an ceasefire, and was joined in his call for an immediate truce last night by Barack Obama and UN Secretary-General Ban Ki-moon. But despite speaking to the US President in a phone call on Sunday night, Benjamin Netanyahu, the Israeli Prime Minister, said Israel's offensive would continue "as long as necessary" to end rocket attacks from Gaza.